406 Beacon is located on the north side of Beacon, between Gloucester and Hereford, with 404 Beacon (2 Gloucester) to the east and 408 Beacon to the west. 406 Beacon was designed by Snell and Gregerson, architects, and built in 1887-1888 by Webster Dixon & Co., masons, for Jeremiah (Jere) Abbott and his wife, Ellen Maria (Bangs) Abbott. He is shown as the owner on the original building permit application, dated May 19, 1887, and on the final building inspection report, dated August 13, 1888. 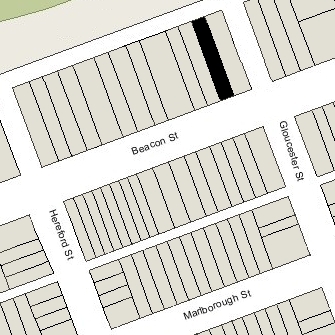 Jeremiah Abbott purchased the land for 406 Beacon on January 28, 1887, from George Higginson, part of a 330 foot parcel he had purchased on January 14, 1884, from the Boston and Roxbury Mill Corporation. On May 27, 1887, Jeremiah Abbott transferred the property into his wife’s name. Click here for an index to the deeds for 406 Beacon. By the 1888-1889 winter season, Jeremiah and Ellen Abbott had made 406 Beacon their home. They previously lived at 11 Chestnut. He was an iron and steel merchant. Jeremiah Abbott died in March of 1895. Ellen Abbott continued to live at 406 Beacon until her death in March of 1920. 406 Beacon was inherited by the Abbotts’ surviving son, Gordon Abbott, a banker with the Old Colony Trust Company. He and his wife, Katharine McLane (Tiffany) Abbott, lived at 240 Beacon. He leased 406 Beacon to others. 406 Beacon was not listed in the 1921 Blue Book. By the 1921-1922 winter season, 404 Beacon was the home of attorney John Kenneth Howard and his wife, Ruth (Gaston) Howard. They had lived at 208 Beacon in 1920. They continued to live at 406 Beacon during the 1922-1923 season, after which they moved to 15 Brimmer. During the 1923-1924 winter season, 406 Beacon was the home of Gordon and Katharine Abbott’s son-in-law and daughter, Francis Bacon Lothrop, an investment banker, and Eleanor (Abbott) Lothrop. They previously had lived at 12 Fairfield. By 1925, they had moved to 19 Charles River Square. On July 13, 1925, 406 Beacon was purchased from Gordon Abbott by Mabel (Kates) Morrison Scott, the wife of attorney Arnold Scott. They previously had lived at 18 Hereford. They also maintained a home in New Bedford. The deed was not recorded until May 15, 1928, and the heirs of Ellen M. Abbott remained the assessed owners through 1928. In 1927, 406 Beacon also was the home of attorney Henry Eldridge Warner and his wife, Henrietta Edla (Slade) Warner. Both the Scotts and the Warners are listed in the 1927 City Directory at 406 Beacon, but only the Scotts are listed in the Blue Book. The Warners had lived at 144 Marlborough in 1926. They also maintained a home in Lincoln. By the 1927-1928 winter season, they had moved to 253 Commonwealth. 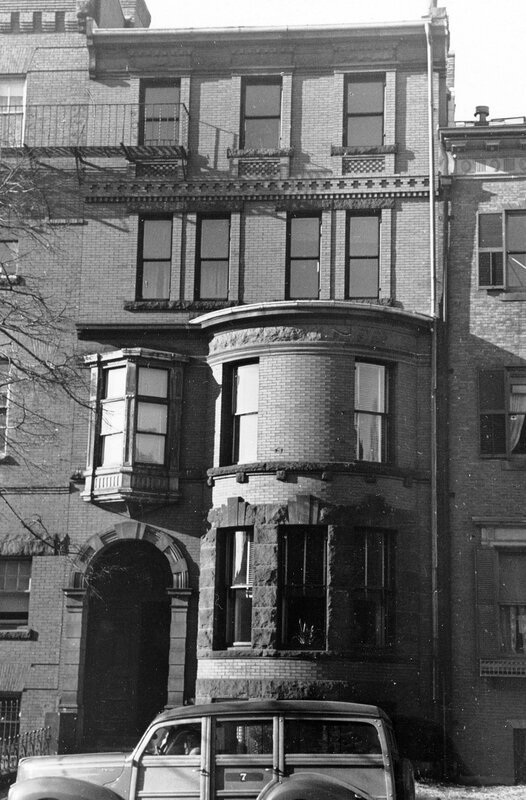 The Scotts continued to live at 406 Beacon during the 1930-1931 winter season, after which they moved to Brookline. 406 Beacon was not listed in the 1932-1933 Blue Books, nor in the 1931-1933 Lists of Residents, and was shown as vacant in the 1932-1933 City Directories. In 1933, C. Codman & Company (presumably on behalf of the Scotts) applied for a lodging house license for 406 Beacon. The application was denied because of lack of egress. In 1934, notwithstanding the permit denial, 406 Beacon was operated as a lodging house, probably by Louis Raymond Goepner and his wife, Helene Anna (Goehring) Goepner. They previously had lived in an apartment at 52 Hereford. They had moved by 1935. 406 Beacon was listed in neither the 1935 Blue Book not the 1935 List of Residents, and was shown as vacant in the 1935 City Directory. On June 4, 1934, the Home Savings Bank foreclosed on its mortgage to the Scotts and took possession of 406 Beacon. In August of 1934, the bank applied for (and subsequently received) permission to convert the property from a single-family dwelling into nine apartments and a doctor’s office. On October 16, 1934, 406 Beacon was purchased from Home Savings Bank by Kathleen J. O’Rourke. She married not long thereafter to Francis J. Lynch, a meat buyer. On June 11, 1936, 406 Beacon was acquired from Kathleen (O’Rourke) Lynch by Lillian Y. Chandler and Inez Ulricka Harrison. 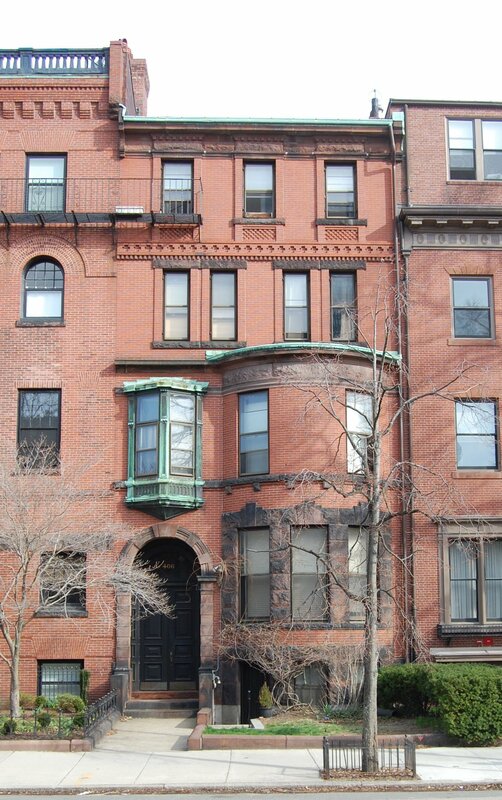 Lillian Chandler operated a real estate rental office and lived in an apartment at 31 Massachusetts Avenue. Inez Harrison was a legal secretary and lived in Somerville. On May 13, 1941, the Home Savings Bank foreclosed on its mortgage to Lillian Chandler and Inez Harrison and took possession of the property. On September 30, 1942, 406 Beacon was acquired from the Home Savings Bank by Alice Erika Berger, the former wife of Alfred Rosenbaum. She lived at 306 Riverway. On October 1, 1945, 406 Beacon was acquired from Alice Berger by Beatrice (Miller) Silversmith, the wife of Peter Philip Silversmith. He was a lawyer, hotel operator, and real estate dealer. They lived in Brookline and later in an apartment at 62 Commonwealth. On November 19, 1945, 406 Beacon was acquired from Beatrice Silversmith by Horace Upham Ransom. He and his wife, Sarah Chaplin (Bent) Ransom, lived in Meredith, New Hampshire. On October 2, 1950, he transferred one-half interest in the property to himself and his wife, and on Februar 16, 1951, he transferred the other one-half interest to himself and his wife. On May 29, 1957, 406 Beacon was acquired from Horace and Elizabeth Ransom by Dr. George J. Colantino and Charles G. Martignette, trustees of the Three Fifty Two Beacon Realty Trust. George Colantino, a physician, and his wife, Edith E. (Fitzgerald) Colantino, lived at 404 Beacon. Charles Martignette, a florist, and his wife, Marie C. (Della Femina) Martignette, lived in Somerville. The property changed hands and on October 31, 1969, was acquired by Irma Edith (Rosen) Shapiro, the wife of Isadore Charles Shapiro. They lived at 218 Commonwealth. He was treasurer of the Harrison Supply Company. On July 31, 1974, 406 Beacon was purchased from Irma Shapiro by Irene Paleologos of Medford. On March 27, 1979, she transferred the property to herself as trustee of the Paleologos Family Trust. On February 18, 2000, she transferred the property to Marilyn M. Kapetanakis, as trustee of the Paleologos Nominee Trust. 406 Beacon remained an apartment house in 2017.